Ali From Cairo was once restricted in Type 1 for being too powerful, but in 93/94 we can play four of them so of course we should! The thing that makes Ali so powerful is that you essentially become unkillable if he is in play. The problem is that Ali more often than not doesn't stay in play that long, a problem this deck is designed to fix. This deck is all about mana screwing you opponent completely without even playing a land destruction spell. Instead the game plan revolves around resolving a Living Plane to make all lands creatures. With Living Plane on the table you then start to pick off your opponent’s lands, which are now 1/1 creatures, by pinging them to death with a bunch of different cards. One of the most used ways to kill the lands is Tim, or as he’s actually called Prodigal Sorcerer. Other good cards are Fireball, Pyrotechnics, Rod of Ruin and if you want to be extra evil, Earthquake. If you go for Earthquake you should build you deck to be able to operate without lands, that means mana dorks, Fellwar Stone and more. However, remember that the opponent also could use cards like that so it’s good to also pack some artifact destruction spells in your deck. Crumble is probably the top choice here as it’s in the main color and because the life doesn’t matter much if the opponent won’t play another spell for the rest of the game. If you are a little slow to lock down the opponent it’s good to have some removal in the deck. If you play a red version, you can use the same cards that later will kill lands as removal in the early game. You should also think about how you will protect your Living Plane as most cards in your deck will need it to stay around. Either you play blue for counterspells or you could use green’s own counterspell, Avoid Fate. Some other interesting cards are Drop of Honey and Sandstorm. Both are quite good at handling your opponent’s lands even if Sandstorm is more of a corner case card. And if you can afford it, The Tabernacle of Pendrell Vale is a fun addition. Last but not least Pendelhaven could also be a really good inclusion as it makes your lands bigger than your opponent’s and Instill Energy can make Tim ping twice. And one more thing, remember that with Living Plane on the battlefield, lands have summoning sickness. So if the opponent doesn't have white mana for his Disenchant he can't just play a Plains and kill your Living Plane. You will have a turn to take care of the pesky land. Atog is one of those cards that laid dormant for some time until someone realized it's potential. The Atog deck of course plays a large amount of artifacts, because otherwise the Atog itself is just a 1/2 for two. But exactly which artifacts to play is open for discussions. Some decks use Mana Vault, Su-Chi and Fireball for some nice synergy. Other decks take a more suicidal route and play a lot of cheap artifacts that first do some damage and then can be sacrificed to deal the finishing blow. Copper Tablets and Ankh of Mishra are probably the most common ones. It's also common for the Atog decks to play a lot of burn in the form of Lightning bolt and Chain Lightning. If you want to splash another color, green should be high on your list as it gives you access to Berserk, and there are few things as scary as a berserked Atog. Goblins is one of the few viable tribal decks in the format with both a bunch of different goblins and a lord to rule them all. The deck usually looks a lot like the Sligh deck but instead of going for the perfect mana curve you go all in on goblins and a playset of Goblin King. The best red goblins that you always see in these decks are Goblin Balloon Brigade and Goblins of the Flarg. The reason why they are better than the rest is because both of them have evasion of some sort. Other goblins you can use are Mons Goblin Raiders, Goblin Digging Team and if you want to splash a color you also have access to Scarwood Goblins and Marsh Goblins. Besides the obvious Goblin King you can also use Gauntlet of Might, Goblin Shrine and Goblin Caves to strengthen you goblins. If you splash green you can also use Pendelhaven to make your goblins more powerful. 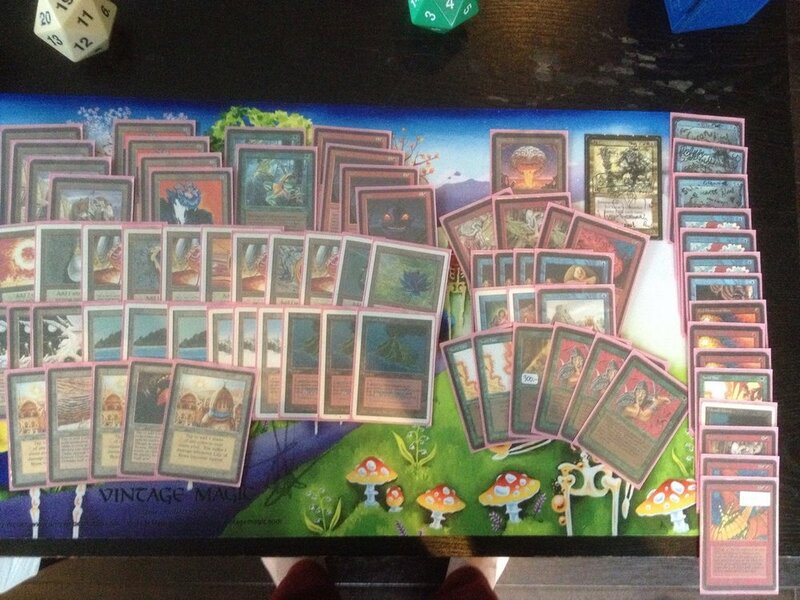 The first Sligh deck was actually created in 1994 so you could say that this is one of the original decks. The name of the deck comes from the first player to have success with the deck, Paul Sligh, even though it was his friend Jay Schneider who built the deck and innovated the game. Jay's innovation was to realize the importance of the mana curve, actually that concept didn't even exist before Sligh. The idea was that the deck should be able to use all of it's mana every turn in a efficient way so that it could kill the opponent before he or she was able to play all of his or hers expensive powerful cards. Therefore, the Sligh deck usually plays suboptimal cards just to get the curve mathematically correct. In the 93/94 format the Sligh deck usually is mono red and contains all the good red aggressive cards like Lightning Bolt, Chain Lightning and Ball Lightning. The creatures in the deck may not be the best creatures in the format but they do their job. Classic choices are Goblin Baloon Brigade, Goblins of the Flarg, Ironclaw Orcs, Granite Gargoyle and sometimes Dragon Whelp. Erhnam Burn'em is a red and green aggro deck that get's its name from the biggest creature in the deck, Erhnam Djinn, and the red part that mostly consists of burn spells. As with many of the decks on this site Erhnam Burn'em can be built in many ways, even without Ernham Djinn if one wants a lower curve. This deck is also quite popular as it can be very budget friendly; Taiga is one of the cheapest dual lands, the burn is also cheap and except for Erhnam Djinn the creatures is also quite cheap. And talking about creatures, this deck usually plays cards like Kird Ape, Argothian Pixies, Elvish Archers and of course Erhnam Djinn. To complement the creatures, you find the classic burn suite with Lightning Bolt, Chain Lightning and Fireball. If you want you can also throw in a couple of Berserks and maybe Giant Growths. The foundation of this deck is a playset of Mana Vaults which are used to power out big creatures as Su-Chi, Juggernaut and Triskelion. The plan is to stick one or more of those big threats early and then ride them to victory while the opponent still builds up their mana or plays creatures that are easily outmatched by yours. The deck usually also plays a full set of Copy Artifacts which makes it possible to follow up your big threat with a two mana copy even though you've already used your Mana Vault. You can also play Serendib Efreets and cut the Juggernauts to make all your creatures "bolt proof". Another consideration is of course the small but threatening creature Atog. Old School Tron - Viable or not? UR Burn is one of the top decks in the format and can be built in many different configurations. The foundation of the deck usually consists of 4 Serendib Efreet, 4 Lightning Bolt, 4 Chain Lightning and a couple up Psionic Blasts. The rest of the deck can either be built to maximize the aggressive side with more burn, Electric Eels and/or Flying Men, or it could be built more as a tempo deck by adding counterspells and some control elements. You can also build the deck with some amount of main deck Blood Moons and Energy Fluxes if you want to be a little hateful. This deck is all about cast huge fiery X spells right at your opponent's face. In the early game the deck focuses on playing mana ramp like Mana Vault and mana doublers like Mana Flare and Gauntlet of Might. Then, with a mana doubler or two in play the deck can use Candelabra of Tawnos to produce even more mana and when the time is right put all that mana into one or two giant Firaballs. Another strategy that can be used is bouncing the Candelabra and Mana Vaults with Hurkyl's Recall to "reset" them and produce more mana. Last but not least the Candelabra of Tawnos can also be used with Mishra's Factory, Maze of Ith and Library of Alexandria for some extra value. You can build this deck without Candelabra of Tawnos and instead go all in on the mana doublers and Forks, then the deck sometimes is called Big Red. This is a combo deck that utilizes a powerful combo which Wizards actually thought was to powerful and therefore tried to stop on many occasions by issuing different erratas. The combo works by combining Power Artifact with Basalt Monolith. This makes the Monoliths untap cost become one colorless and as it still taps for three colorless you are able to get infinite mana. This mana is then used to end your opponent with a huge Fireball or sometimes the classic artifact Rocket launcher (but do remember that Rocket Launcher has "summoning sickness"). The rest of the deck can be built in many ways but it usually uses a lot of counterspells to keep you alive and protect the combo. Sometimes the deck is built like a toolbox deck that uses Transmute Artifact to get the right answers or combo pieces like Basalt Monolith and Rocket Launcher.